Four of our native butterfly species over-winter as adults: Peacock, Small Tortoiseshell, Brimstone and Comma. As they spend a large part of their lives hibernating some individuals might survive for as long as ten or eleven months. It's possible that you might see one of them on a warm sunny day in the winter months, interrupting its slumber to bask in the sunshine, or flying in search of an early nectar source. As delightful a sight as this is, what I really look forward to is seeing a bona fide spring butterfly - one that has completed its life cycle through to adulthood in the new year. The first species to emerge could be one of several - but the one that seems to me to exemplify spring in the way that daffodils and primroses do is the Orange Tip. 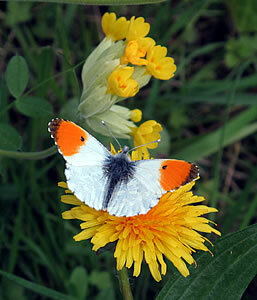 It is the male only that has orange tips; the female is rather dowdier. In the butterfly world it's usually the male that is the 'trollope' - the more brightly coloured of the sexes. 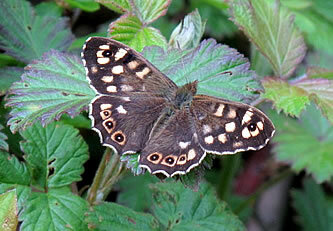 At Carymoor this species is a common sight from mid April through to June. As the spring approaches I am looking forward to re-acquainting myself with all my Carymoor friends of the invertebrate variety, with whom I have worked so closely, for the last eight years. As I have grown to know both them and the site better, I seem to have developed a sixth sense that anticipates their habits and foibles. Each species seems to have a personality of its own. 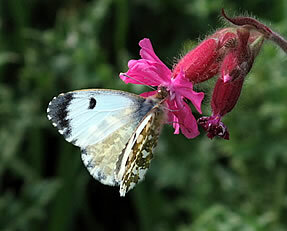 For instance, the Orange Tip is a busy commuter - on a mission, flying rapidly along hedge lines, occasionally jamming on the brakes to descend to nectar momentarily before speeding on - rather like a city business type stopping for a brief caffeine hit at a Starbuck's on Waterloo concourse before rejoining the rat-race. Another hedgerow butterfly - the congenial Speckled Wood - dances around you as if to ingratiate himself with you; that is until he confronts another male of his own species and then the two turn into a pair of whirling dervishes swirling high into the canopy like Morris dancers, menacingly waving their white handkerchiefs at each other. The territorial dispute resolved, the prevailing male dusts himself down and resumes his perch to wait for the next passing human to befriend. This butterfly will fly in shadier conditions than any other, apart from the White Admiral - a butterfly of mature woodland that does not occur at Carymoor. One of my favourite spring butterflies (slightly later on in the season) is the Green Hairstreak - one of the glitterati of the butterfly world, posing nonchalantly on a bramble leaf like an emerald jewel, an element in the spring symphony of greens. This species is one of the few butterflies with deeply iridescent wings, although most butterflies' colours are iridescent to a greater or lesser degree. In Quality Street terms it is the hazelnut noisette in milk chocolate - the triangular one in a metallic green rapping! 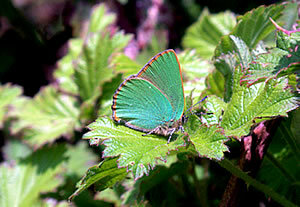 The Green Hairstreak is the only truly green British butterfly. The male can't be asked to chase females; he waits for them to come to him while he poses in all his finery - what a tart. (caterpillar) is attended by ants as in the case of the Adonis and Large Blues. The larva can 'croon' to the ants to attract their attention and they offer it protection until it reaches the pupa (chrysalis) stage. These are just a few of my invertebrate friends - and they are not confined to butterflies. Marking their reappearance each year is more significant to me than the month of the year or the season. I depend on them, in a spiritual sense, but can they depend on the species I represent? The three afore-mentioned butterfly species are not in any immediate danger - but most are, due to habitat loss and modern farming methods. These ephemeral creatures, the proverbial canaries in the coal mine... each year at Carymoor I wonder, will it be the last time that I can greet a Small Heath, a Small Blue or a Brown Hairstreak? 19th March: Living Willow Structures. Amanda will show you how to make an arbour or garden seat. 7th May: Advanced Basket Making. Not just for the more experienced - who will be making oval and square baskets, beginners are also welcome. We will provide experienced leaders to run eco-friendly games and exciting craft activities. We can provide lunch or tea and if required, a bespoke birthday cake - alternatively you are welcome to bring your own food. We will supply colourfully decorated rooms, cutlery and crockery. For pricing and further details, please see our website: www.carymoor.org.uk; or ring Julia on 01963 350143.